This year the group will start on 20th September it will run every week for 8 weeks. It will be on each Tuesday, meeting from 6:15pm at the Rugby club in Okehampton to start at 6:30pm for up to an hour. The cost for the 8 weeks is £10. On Wednesday two ORC’s took part in the Buy With Confidence Exeter 10k, held in the evening on Exeter Quay. This is another flat fast course on the footpaths and cycle tracks around the river Exe and Exeter Canal. Both had good runs and clocked new PB’s with Chris Turner finishing in 40.18 and Mark Hawkins very pleased with his time of 44.39, being in the middle of training for his first marathon. 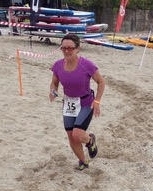 Saturday saw a new event on the calendar, a double bill of distances organised by pureTrail. 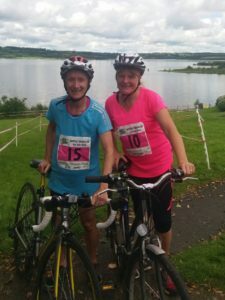 There was a choice of The Crossing, an Ultra marathon starting from Belstone and crossing the moor from north to south, or The Great Escape, a half Marathon starting from Princetown and taking in the last 13.2 miles of the longer race. Katie Littlejohns chose the Great Escape, which involved some tricky uphills despite having a largely downhill profile, crossing the head of the Erme valley and following the Abbots Way before the long downhill into South Brent. Dartmoor running is second nature to Katie and she had a great race, coming in third lady and 18th overall in a time of 2.00.56. Miles away in Snowdonia, Ray Lawrence, took to the Welsh mountains to run the Snowdonia Trail Marathon. This immensely challenging race has over 1,685m of ascent and follows spectacular, scenic trails which circumnavigate Snowdon and eventually climb it at mile19. Unfortunately a wet day, with thick fog and mist making for difficult, slippery conditions on the wet rock, meant Ray could not really appreciate the scenery. He still ran well though and was relieved to finish in a very good time of 5.52.28. 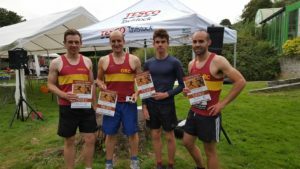 ORC was well represented at the Tavy Town relays last Wednesday evening with five teams entered, two of which were amongst the prize winners. 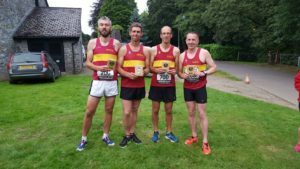 Always a popular event with a huge number of competitive teams running, the Male Vet team of Andy Vallance, Geoff Hill, Rob Hicks and Paul Crease stormed round to come fifth overall and first Male Vets. The Senior Men’s team of Will Lamerton, Matt Pitson, Graham Bryant and Mark Harding were also on fire, coming third overall with Will Lamerton putting in an incredibly fast time of 5.01 for the 1.1mile lap, before running the fourth leg for the second Senior Men’s team in an also incredible 5:25! 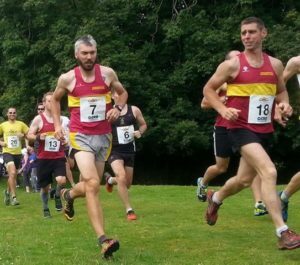 Sunday saw us hosting the first event in our summer series of races, the Cosdon Hill race. This is run as part of the Belstone Village Fair and starts on Belstone Common with runners taking their own line to race to the top of Cosdon Beacon, which can be seen from the start, and back, over a distance of 3.2miles. Unless you go via Sticklepath! Rob Hicks’ second appearance for the club this week saw him triumphant again, finishing first in an impressive 30.00 with Andy Vallance taking third place in 30.58. Much further afield, Caroline Wilson returned to her home territory to run the Dundee Half Marathon. Here it was typical Scottish weather with wind, rain and a temperature of just 11degrees. The rain did stop but the wind was relentless. Despite this Caroline was able to secure a PB of 2:00:06, which was very close to her target of sub 2 hours! Error: Error validating access token: Session has expired on Saturday, 20-Apr-19 03:20:42 PDT. The current time is Monday, 22-Apr-19 11:38:03 PDT.